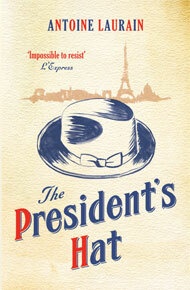 The President’s Hat by Antoine Laurain is another playful offering from Gallic Press, whose The Suicide Shop I reviewed just last month. As he picked up his second oyster he glanced discreetly to his left. The President had put on his glasses and was reading the menu. Daniel took in the famous noble profile, seen in magazines, on television and every New Year’s Eve for the past five years. Now he was seeing that profile in the flesh. He could have put out his hand and touched François Mitterrand. The waiter returned and the President ordered a dozen oysters, and the salmon. The large man chose mushroom pâté and a rare steak, while Roland Dumas followed the President’s lead with oysters and fish. A few minutes later, the wine waiter appeared with a silver ice bucket on a stand containing another bottle of Pouilly-Fuissé bathed in ice. He uncorked the bottle smoothly and poured a little into the presidential glass. François Mitterrand tasted it, approving it with a brief nod. Daniel poured himself another glass of wine, and drank it down almost in on, before taking a teaspoon of the red shallot vinegar and dressing an oyster. ‘As I was saying to Helmut Kohl last week…’ Daniel heard François Mitterrand say as he ate his oyster. Never again, he told himself, would he be able to eat oysters with vinegar without hearing the words: ‘As I was saying to Helmut Kohl last week’. The premise is relatively simple: The French President François Mitterrand loses his hat in a Parisian brasserie. Well, technically, Daniel steals it after dining next to the President and his party. Through the course of the book the hat continues to change hands and transforms the lives of the four characters who wear it. The prose is straightforward. The story sweet. Like The Suicide Shop, The President’s Hat has the slapstick quality of a French comedy. It is not particularly complicated or challenging, but very engaging. The relaxed, gentle tone in how it is told reminded me of Alexander McCall Smith’s No. 1 Ladies Detective Agency series – slightly more whimsical. Which reminds me of a friend of mine who went to a book-signing by Alexander McCall Smith at Barnes & Noble. She came back completely charmed. The author relayed an anecdote in which someone asked him why there were no car chases in his novels. He laughingly replied that he felt it would be irresponsible of him to include a car chase in one of his books. That his readers might not be able to handle that level of excitement. But, as a compromise, he had included a shopping cart chase in the new novel he was there to sign. It received a huge laugh and a smattering of applause from the crowd. They knew it to be true. There’s always been a readership for quiet books in which very little happens. Several examples come to mind. The types of stories found in Ladies Journals were very popular when Ladies Journals were in their heyday. Today, the Persephone Press seems to thrive on catering to the quiet reader with re-prints of books by women authors from the first half of the 20th-century. And while planning this post I kept thinking back on some of my favorite books/authors from when I was younger: Louisa May Alcott’s Little Women, Jack & Jill, Under the Lilacs and Eight Cousins were read multiple times; and the Laura Ingalls Wilder Little House series. Those books had more in common with McCall Smith novels than what I read now. So I’m wary of being too hard on or of dismissing The President’s Hat simply because I don’t have much to say about it. I did read it in one sitting, cover to cover, and enjoyed it (particularly the little twist at the end). I loved each of the characters who found the hat and became completely wrapped up in their individual stories. This may be the perfect book for a quiet evening at home. Antoine Laurain appears to have no aspirations other than to amuse his readers with a tale well told… which he does. At least this reader was amused. And I’m sure my friend who reads Alexander McCall Smith will love it. In fact, I just sent her the recommendation on GoodReads. Great review. On occasion, I do enjoy a quiet novel like this. I love the Alexander McCall Smith story you shared. Too funny!